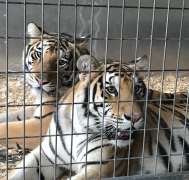 "STOP THE ANIMAL EXHIBIT BAN IN KINGMAN, AZ"
Animal rights extremists are working to wrongly influence the City of Kingman, Arizona to draft an ordinance that would prohibit the public performance of wild and exotic animals. It states on the City of Kingman government website that their "Staff was directed to draft an ordinance that prohibits the public performance of wild and exotic animals." We all know the radical animal rights groups were the ones doing the "directing" to mislead City of Kingman Staff. Staff recommended approval of the draft ordinance, however there was a motion to table the ordinance until the April 2, 2019 meeting which was passed by a vote of 6-0. Please click the "Send Message" tab below to send your emails to the Kingman City Council Members to OPPOSE this misguided ordinance to outright ban legal and highly regulated businesses from displaying their animals in Kingman, Arizona. Please customize the boilerplate letter given as a guide.